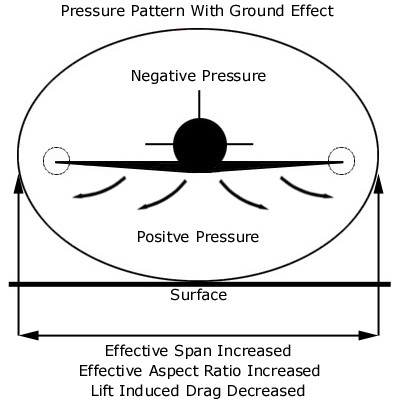 Ground effect is caused by ground interference with airflow patterns around an aircraft when the aircraft is within one wingspan of the surface. If the approach airspeed is too fast, the aircraft will tend to float down the runway, delaying touchdown of the aircraft. This can create a dangerous condition where the aircraft may actually run out of runway space, creating an unsafe landing condition. If this situation were to occur, a prudent pilot would perform a go-around and land again. Ground effect applies to all fixed-wing aircraft, including sailplanes and microlights. The wingtip vortices streaming behind an aircraft follow a downward inclined path for some distance behind the aircraft and then gradually level out to follow a path at a lower level than the aircraft and also drift apart. 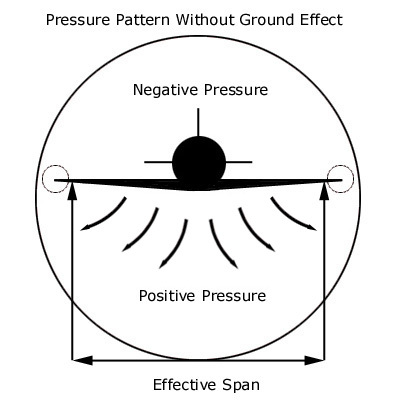 The pressure pattern about an aircraft flying outside ground effect becomes almost cylindrical, with positive pressure below the wings and negative pressure above the wings. These pressure differentials are felt quite a distance from the airframe, and the cylinder of affected air has a diameter close to the wingspan of the aircraft. 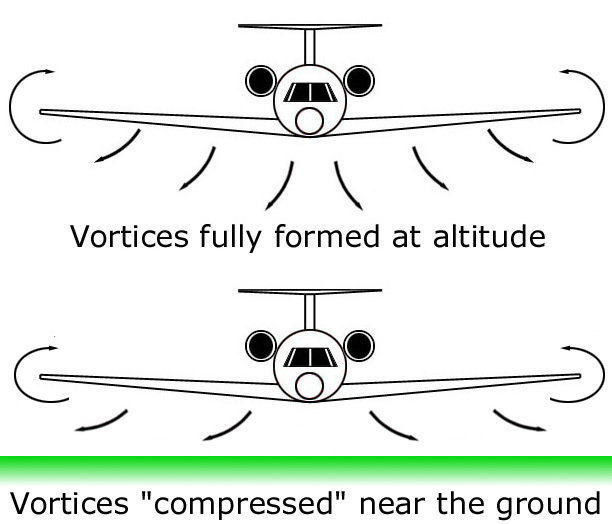 When the aircraft is close to the surface, the almost cylindrical vortex-induced circulation around the wing outside ground effect is modified by coming into contact with the surface. This flattens the cylindrical circulation pattern as well as reducing the down-flow angle of the airflow behind the wing. The flattening on the circulation pattern spreads the pattern outwards below the wing, thus increasing both the effective span of the wing and its aerodynamic aspect ratio. During the 1980s, the Soviets continued testing various ground effect vehicles for use in coastal defense and amphibious operations. The ORLAN-Class takes advantage of the increased aerodynamic lift that occurs when a wing operates near the surface. This greatly increases the craft's ability to carry heavy loads over long distances, especially over water, making it well-suited for amphibious warfare. 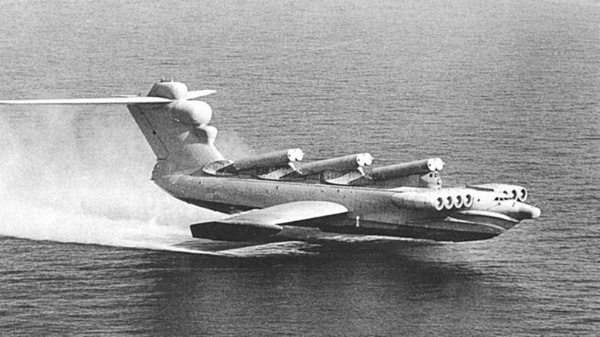 In 1966 the Central Hydrofoil Design Bureau under Rostislav Alekseev produced a gargantuan "ekranoplan" ("surface plane") combining the smooth hull form of a ship with stub wings, a large vertical fin and horizontal tail. The craft featured ten engines: eight mounted in two clusters of four directly behind the cockpit to provide augmented lift, and two on the vertical fin to provide cruise power. This machine, which American intelligence organizations dubbed the Caspian Sea Monster, could lift 540 tons and cruise at over 300 mph at an altitude of over 10 feet. Created November 30, 2009. Updated June 1, 2015.